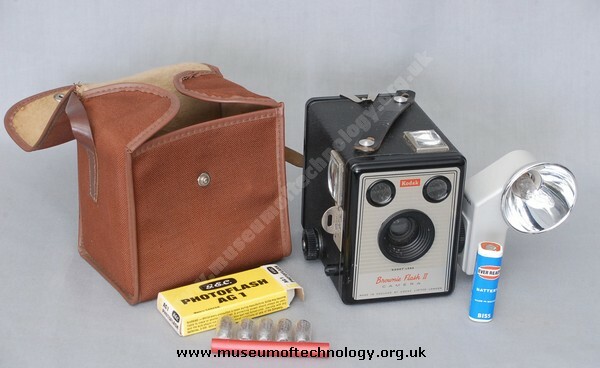 The Kodak Brownie Flash II, III and IV were box cameras, taking 2� � 3�" exposures on type 620 film. Construction was of sheet metal, with plastic shutter-release button and advance knob; they were made by Kodak Ltd. in England from 1957-1960. The Brownie 2 has a close up lens position and 'B' (held) shutter facility.They were improved versions of the Brownie Models C, D, E, and F. Each was synchronised for flash with Kodak's screw-and-pin flash fitting on the opposite side to the controls. Fitted with Brownie Flash 5 unit. And pack of AG1 bulbs. The flash battery type B155 is also shown.